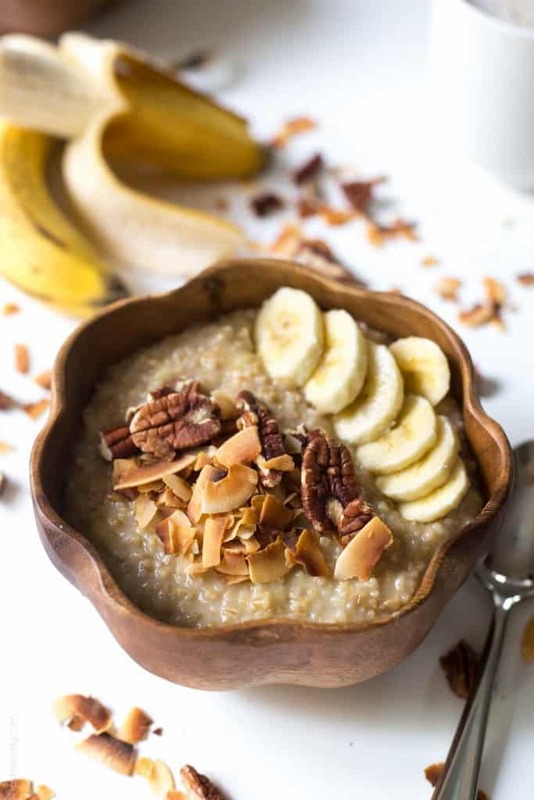 Delicious coconut banana steel cut oatmeal, made with coconut milk and sweetened with coconut sugar. Topped with toasted coconut flakes and pecans. A healthy and flavorful vegan and gluten free breakfast that is refined sugar free. Make a big batch and reheat throughout the week! Shawn works at his job Tuesday-Saturday, rather than the normal Monday-Friday. When he first found this out after getting hired, I was the tiniest bit bummed. We would only have 1 day off together, and it would make it tricky for all the weddings we film on Saturdays. But it’s actually turned out to be great! He is home by 3:00 (that boy leaves for work early! ), and on Saturday mornings I can get so many chores done undistracted. I clean the house, do all of our laundry, grocery shop, work on my blog while watching my cooking shows, and usually take a nap. By the time I wake up, he’s home and we have the whole rest of Saturday. Then, on Sunday’s I can enjoy our whole day together in our perfectly clean house, without any “to do” list items haning over my head. Plus on Monday’s when I’m at work, Shawn can wire in and get a ton of video editing done. It’s works out great! I do miss all the weekend trips we used to take, but not paying for gas, hotels and food is definitely letting our savings account get higher. More money for baby stuff! When it comes to breakfast, Shawn loves what we call “big boy breakfasts”. Eggs, potatoes, bacon, toast. He doesn’t get too excited about some of the girlier breakfasts I like to have, like granola with fruit and yogurt, smoothies, or oatmeal. So on Saturdays, when I’m making breakfast for just myself, it’s light and healthy girly breakfast galore! 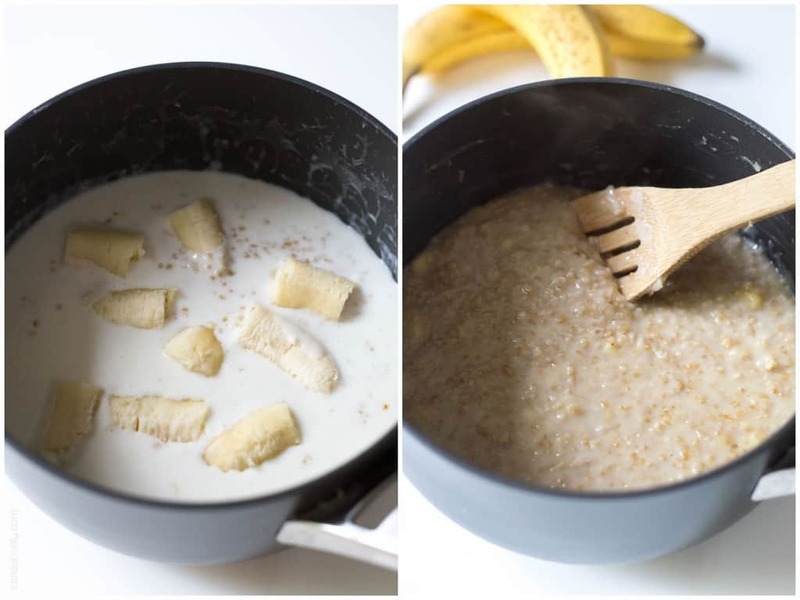 Lately, I have been obsessed with this coconut banana steel cut oatmeal. It’s my new favorite way to use up over-ripe bananas. I am a huge fan of steel cut oatmeal. It takes a bit longer to cook than regular oatmeal, but I love the flavor and texture so much more. And you can’t beat all the added health benefits. I cook the steel cut oatmeal in light coconut milk, and then 10 minutes before it’s done cooking I mash in a banana and stir in some coconut sugar. 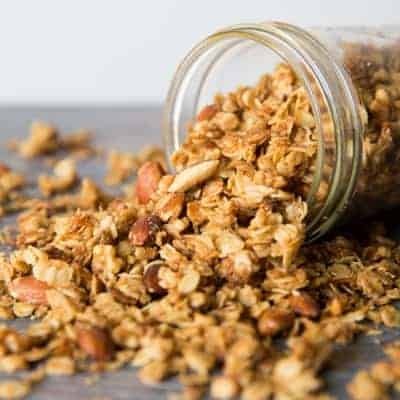 Top it with some toasted coconut flakes and pecans, and you have got the most delicious and healthy vegan and gluten free breakfast that is refined sugar free! 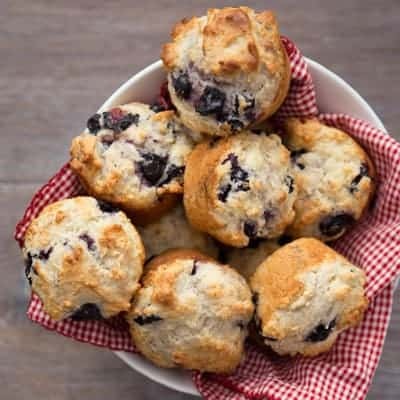 To make this a speedy weekday breakfast, I’ll make a big batch on the weekend, then reheat it in the microwave each morning. It does tend to get a little thicker after it cools, so I thin it out with a little water and it tastes just as delicious as the day I made it. In a medium size pot, bring the coconut milk to a boil. As soon as it starts to bubble, add the steel cut oatmeal and salt. Reduce heat to medium low, and cook uncovered for 20 minutes, stirring occasionally. Add in the 2 bananas, and “mash” the banana into the oatmeal with a wooden spoon or potato masher, kind of like how you would break up ground meat. Add the coconut sugar, start with 2 tablespoons, and add more if you like it sweeter. Continue cooking for 10 more minutes uncovered. 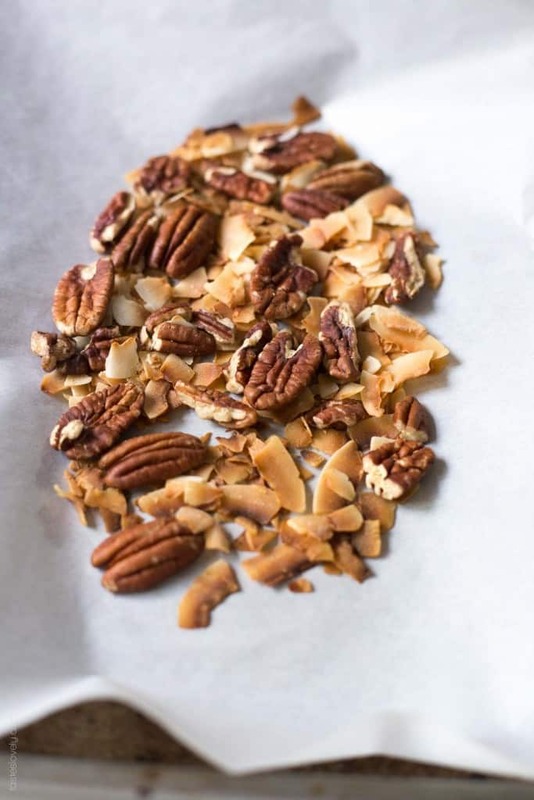 Toast the pecans and coconut flakes in the oven for about 5-7 minutes, until just turning golden brown. 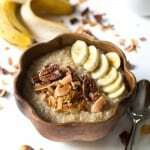 Serve the oatmeal warm, and topped with slices of fresh banana, and the toasted pecans and coconut flakes. Leftovers will keep in an airtight container refrigerated for 1 week. Reheat in the microwave, thin with a little water if necessary. *double check your manufacturers recommended cook time for the steel cut oatmeal. Mine was 30 minutes, but adjust cook time accordingly if necessary. *I like unsweetened coconut flakes, but you could use sweetened if you like it sweeter. 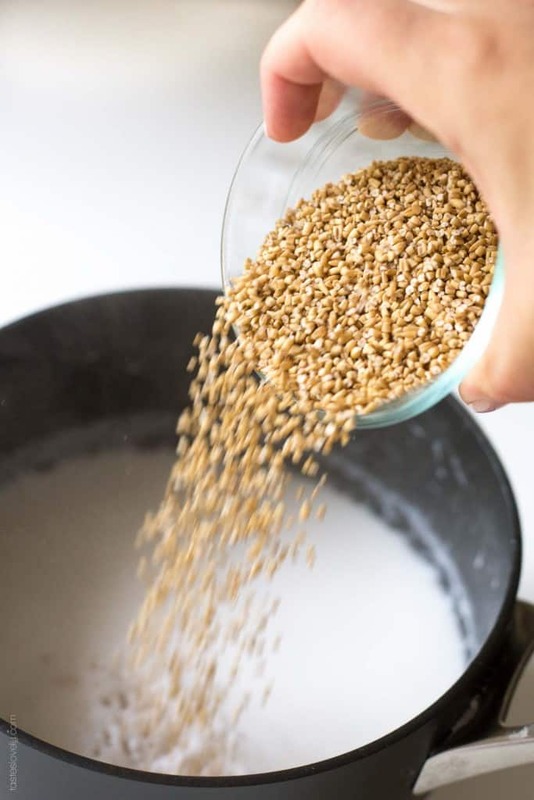 *You could also use this for old fashioned rolled oats. Just substitute coconut milk for water, and cook according to manufacturers instructions. *If gluten free, make sure you buy steel cut oats that are labeled Gluten Free. This steel cut oatmeal looks fantastic, Natalie! Can you believe I’ve never made steel cut oats before? I definitely need to change that after seeing this recipe. I love the coconut and banana combo! I am completely obsessed with these steel-cut oatmeal, Natalie! Honestly, your photos are seriously SO gorgeous and coconut + banana = automatic winner! This looks so awesome! I love the coconut and banana combo…yum! And so healthy :). Oh I love love love a good bowl of oatmeal! And that toasted coconut looks amazing! I used to work irregular hours, but really irregular, usually nights. I hated the fact that I couldn’t spend much time with my boyfriend at the time. It sounds though like you’ve figured out a great arrangement. You won’t miss the weekend trips so much once your little one has arrived. And yes, more money for baby stuff is always a good thing! It’s funny, Branimir loves my girly breakfasts almost more than I do. I will try this recipe for us this weekend, as I’m always looking for healthy breakfast options we can eat with our girl. I’m thinking about adding a tablespoon of unsweetened cocoa to it to make it extra-special. Thanks for sharing the recipe, Natalie! Haha, okay I’m with Shaun on this one. If I had to choose, it’d be a big breakfast every morning! We all love oatmeal here though, but I always buy quick oats (because I’m lazy!) — I’ll definitely have to try making a big batch in advance! I’m very serious about my oatmeal…I love it so much and eat it almost every day. 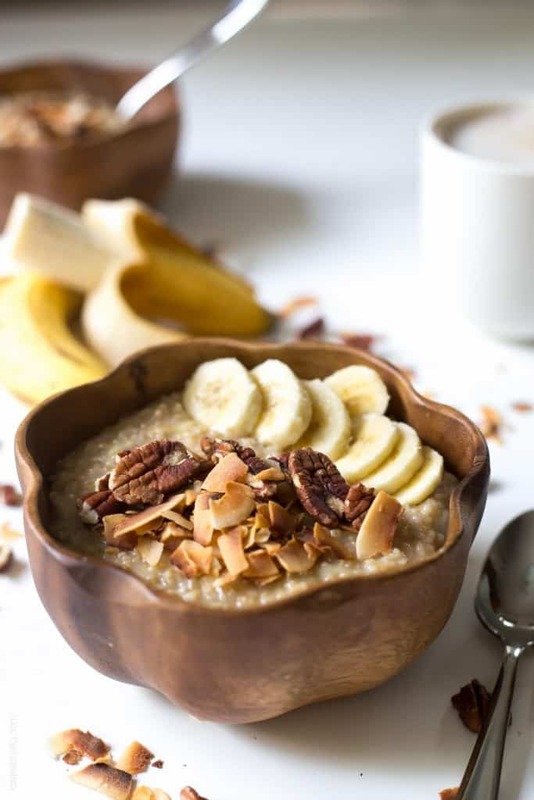 Steel cut oats are one of my favorites, and you’ve made such a warm, inviting bowl here, Natalie! Your photos are gorgeous and I love the coconut-banana combination! I love oatmeal, especially when bananas are involved, but I never really make steel cut oats. I forget how delicious they are! This recipe looks phenomenal. Pinned! Weekends are way to short, aren’t they? I love having all the chores done so the weekends can be free to play and enjoy going a little slower. The best! 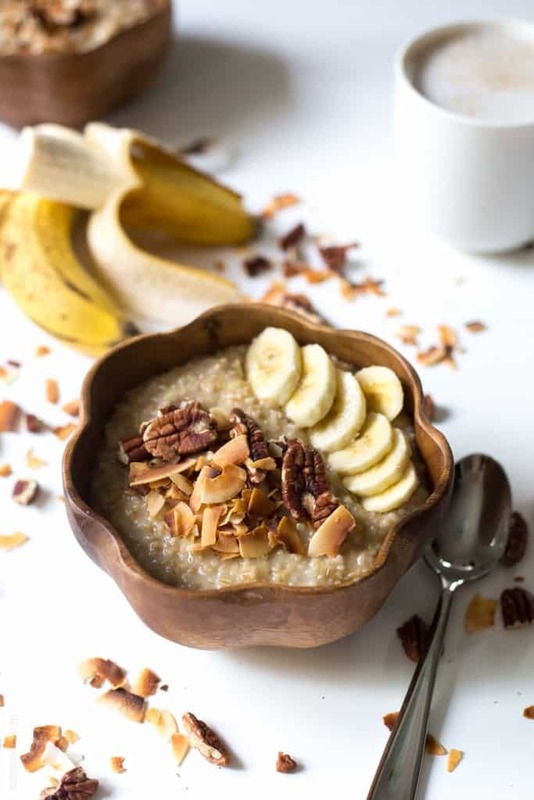 Delicious combination of coconut milk, banana and steel cut oats and the fact that this is a speedy breakfast! Making breakfast ahead of time makes busy mornings so much smoother. Thank you for this my dear! weekend work is the worst! 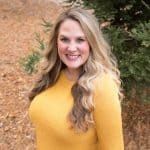 I used to work Tuesday – Saturday and my husband was not too thrilled when I took that job. Thankfully I have my Saturdays off again and I can go to all the yard sales I want! I’m glad you have a good system down though! I’ve never cooked steel cut oats before but I love oatmeal so I know I will love this! I have to admit, I’m a little jealous of your quiet Saturdays where you can get so much done! Weekends always go way too fast, don’t they? It’s been too long since I made steel cut oatmeal, and this one is calling my name! Your photos are gorgeous! I always add mashed banana to my oatmeal with a bit of peanut butter! But I think I may have to change that soon and make this instead. Love this, Natalie! This looks so good! I love steel cut oatmeal, and I love all the flavors in this version! Wow talk about delicious! I would LOVE to wake up to a beautiful bowl of this tomorrow morning. Your photos are really lovely. now this is my favorite type of breakfast! love it! You’re totally making me hungry for oatmeal. And that doesn’t happen very often. Now coconut…I’m always in the mood for that. Hope you’re having a great week Natalie! Your husband sounds just like my boyfriend. He isn’t into “girly” breakfast or lunches. Those boys… but anyways this oatmeal looks so delicious. I love the coconut and banana combo. Yum! YES to the girly breakfasts lol!!! This looks amazing! Coconut and banana were clearly made for each other. Can’t wait to try this one friend! What is with men and their issue with certain foods being girly?! Kyle is the same way! This oatmeal looks fantastic! 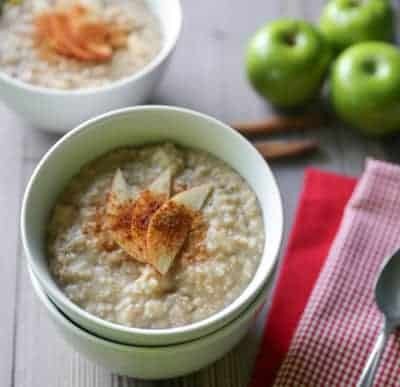 I bet this will be the perfect cool morning meal this fall!